Kappou Yamashita, a Japanese style restaurant, is located at Gion near the Kamo-river. Lots of excellent Japanese cuisines are lined on this area. Usually, it's difficult to visit a high grade Kyoto cuisine restaurant easily, but you don't need to feel pressured to be here. The owner is really friendly and a good talker even though you are first time visitor. Please enjoy outstanding Kyoto cuisines and amusing talk with staffs who are behind the counter. One of the signature points of this restaurant is that you can watch how to cook by the cuisinier, it is almost performance like a magic or circus! I guess you can not decide what you order due to plenty of menu, in that case, please ask friendly staffs about today's recommends ! Boiled radish or pickled radish are famous but, texture of this steamed radish is pretty different from these. It is very soft and mild. Radish is one of the famous vegetables in Kyoto during a winter season. The left photo is yellow tail which is ready to eat in this season (December). Radish, chopped green onions and wasabi are rolled with sliced yellow tail. Yellow tail is fatty and it melt in your mouse after your first bite. Presentation is perfect . 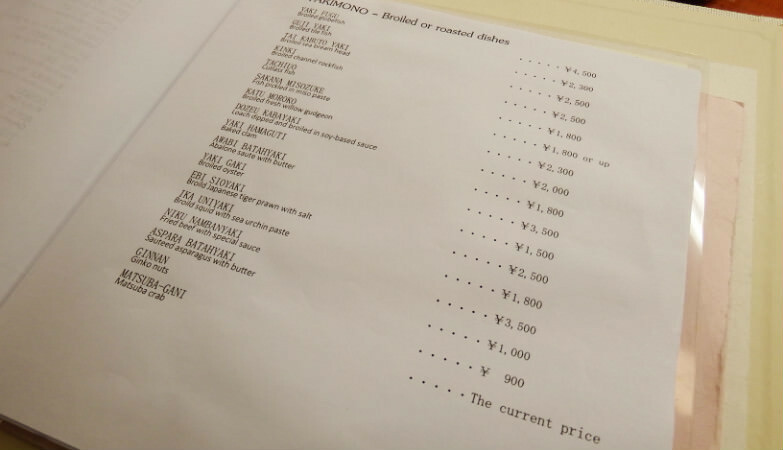 English menu is available. If you want to try ingredients which are displayed in front of you, please just point it out ! You should taste seasonal items. Please ask to some staffs about today's recommendations and check ingredients which are displayed on the counter. At first, I was nervous because this is my first time to visit Kappou restaurant. I didn't know, what I should order, what I should do after sitting our seat. But taisho( Taisho is Japanese nick name of owner) is friendly to us and his smile makes us relaxed. I believe that their service makes the taste better. 3-minute walk from Subway Tozai Line Kyoto Shiyakusho-mae Stn.